Are you ready to upgrade your life and create a year of abundance? Are you tired of setting goals and not reaching them? What would it be like if you were surrounded by beauty, had a day of uninterrupted time to focus on your desires/goals, and had mentors to guide you along the way? According to the laws of the universe, you get what you focus on. If you want to live a more creative, prosperous and fulfilled life, the best way to attract those things into your life is to start experiencing them first hand. When you start creating, you feel more creative. When you put yourself in an inspiring environment, you feel more inspired. When you surround yourself with positive, ambitious and smart women, you start to feel more positive, ambitious and smart. 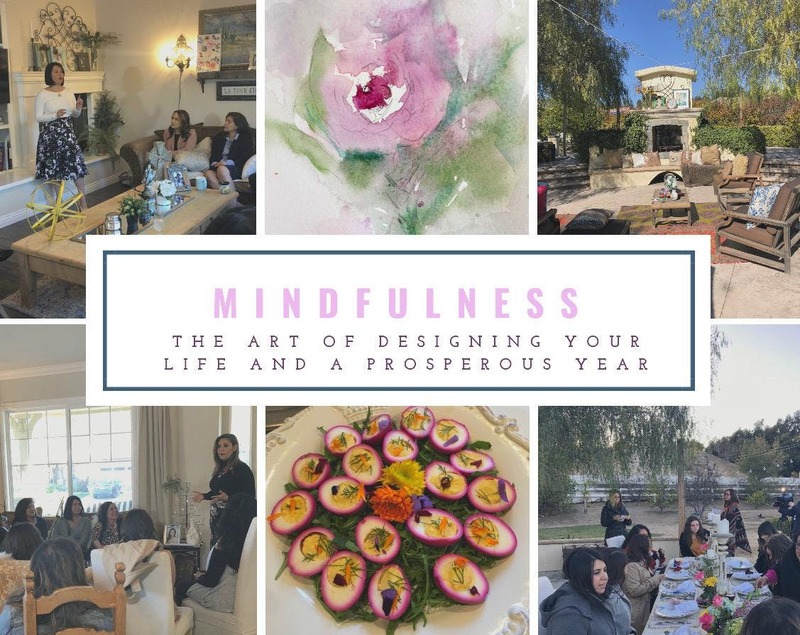 This VIP Mindfulness: The Art Of Redesigning Your Life And A Prosperous Year experience is designed for the creative/entrepreneurial women who are ready to redesign their best life. Check out last event featured by Univision : NOTE This event will be in English. You will learn the Step Process to Success. There will be time to reflect, to bond with an intimate group of like-minded women, to get clear on your life and or business intentions and to make an action plan to turn your dream into reality. We will help you to clarify your vision and how to start making your dream a reality! Tapping into your power to create wealth by surrounding yourself with beauty, nature and a positive enviorment to grow your business, invest in your health and create radical changes for your future. This all day workshop start will help you reach your 2019 Goals with major accountability and support. Creative outlet workshop- This day that will feature an original personalized journal design that Norma will be teaching you the basic techniques of this medium. She will inspire you with inspirational conversation & meditations. Fun Financial literacy and wealth creating workshop- Natalie will show you how to have fun, fabulous and frugal. Catered Dinner prepared by Professional Executive Chef Manny Benitez IG @TheMannyB under the stars, music and wine. Accountability group set up, Personalized swag bags and books will be provided to all participants (Value $200) A consulation with both workshop faciliators (value of $500), This workshop will sell out AGAIN as this is a private event, Casual Wear. A private invitation will be sent to you after purchase along with a few items to bring with you the day of event. Norma Rapko is an award winning, artist, designer, author, speaker and inventor of Crystyler and Bling It On. As a style icon and Latina crafting celebrity, the Norma Rapko brand has been sold and featured in hundreds of retailers and media outlets, including Michaels, HSN, Wal-Mart.com, Amazon, NBC and most recently a National infomercial for her invention Bling It On. She is passionate about her mission to inspire and empower others through beauty and creativity proving that anything is possible. She inspires and motivates people into action by sharing her rags to riches story Although she is devoted to her passion of creativity, her true mission is her family and giving back to the community. Natalie Torres-Haddad is a TEDx Speaker an International Award Winning Author for her published book Financially Savvy in 20 minutes. A bilingual speaker workshop facilitator, a real estate investor and educator. Born in El Salvador, raised in Inglewood she was surrounded by those facing permanent debt. Determined to be the exception, by age 24 bought her first rental property and several after. She is most known for her success in collaborating and making well known start ups. Her activities have been covered in Huffington Post, LA Times and Toastmasters Magazine. Has travel to over 30 countries and resides in Los Angeles, with her Husband and two dogs. Host of Financially Savvy in 20 minutes Podcast-Interviews with self made millionaires, the tips, tricks and tribulations. Natalie will present an interactive and fun financial workshop that allows each participant to define and prepare themselves to take immediate actions on their financial goals. Worskheets will be provided and a chance to feel supported and encourage by other women helping you succeed. Your follow up invitation will explain what to prepare before event. All materials will be provided at event. No refunds, but tickets are transferable up to a week prior to the event. No walk ins registration closes by Feb 28th or if sold out prior to event date. This workshop will be in English. All information will be sent to you once you sign up.